Whoops! This one got away from me. This lesson was from waaaay back in January. It seems so long ago now that teachers report back to school in a little over a week! 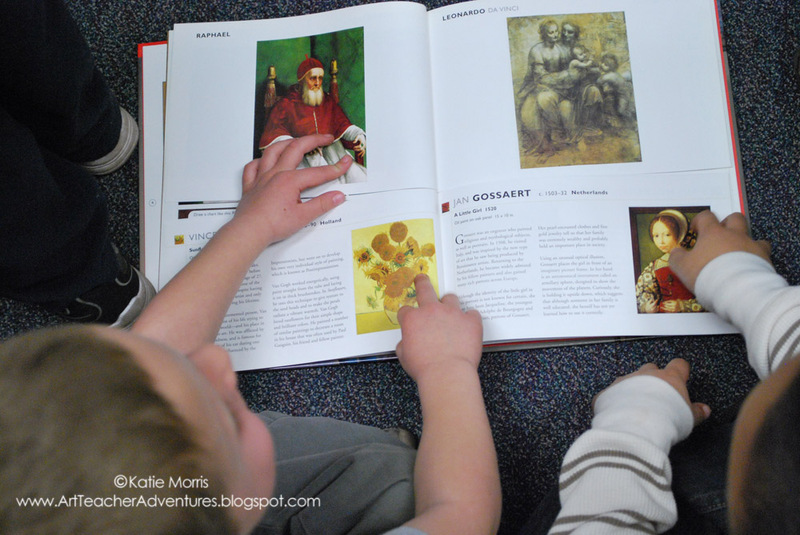 Kansas Day is January 29th so I had planned a Kansas-themed project for each K-3rd grade in January. 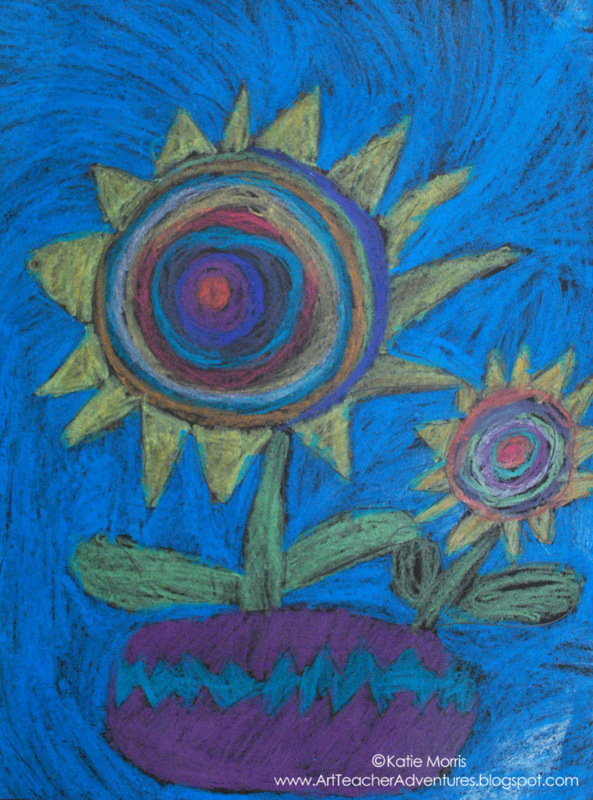 My plan for Kindergarten was to integrate some more Art History by making Kandinsky-inspired concentric circles to use as the center of drawn sunflowers. The concentric circles turned out too cool to cut, so I changed it into two lessons and. 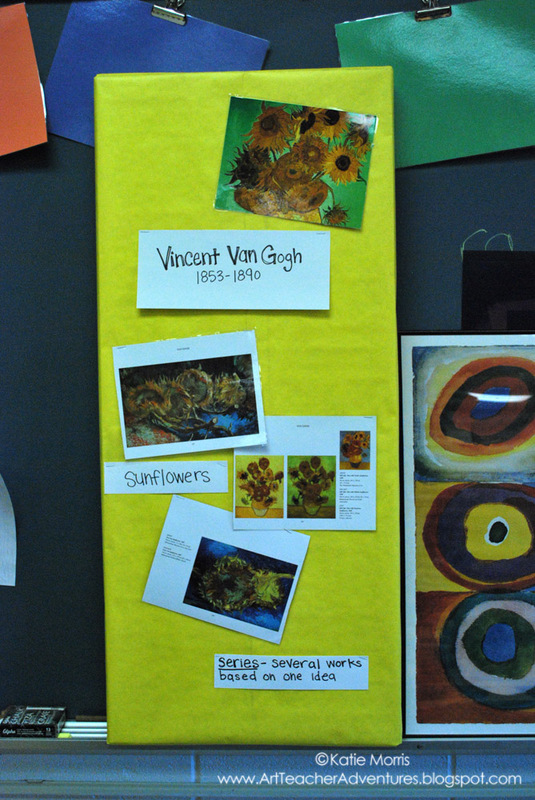 The students learned about Vincent van Gogh and his sunflower series, as well as how a sunflower grows. We even watched a time lapse video of some dwarf sunflowers growing, then because the students had lots of energy that day, each found his/her own spot on the floor and acted out a sunflower's life cycle from seed to wilting. My inside-the-classroom bulletin boards were full, and honestly, they're kind of hard for big groups to see, so I made a portable van Gogh display that I could hold while the students sat on the floor around me for our talk. I wrapped a skinny box I had saved in yellow butcher paper then just stapled in some of the van Gogh sunflower prints I had recently been given as well as some labels- his name and dates, the word "sunflowers" and the word "series" with the definition, "several works based on one idea". 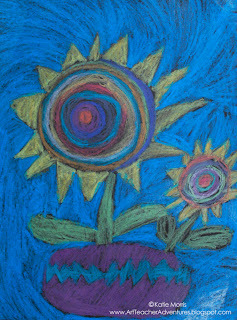 The first class period was spent talking about sunflowers and Vincent van Gogh, and getting pencil drawings laid out on black construction paper. 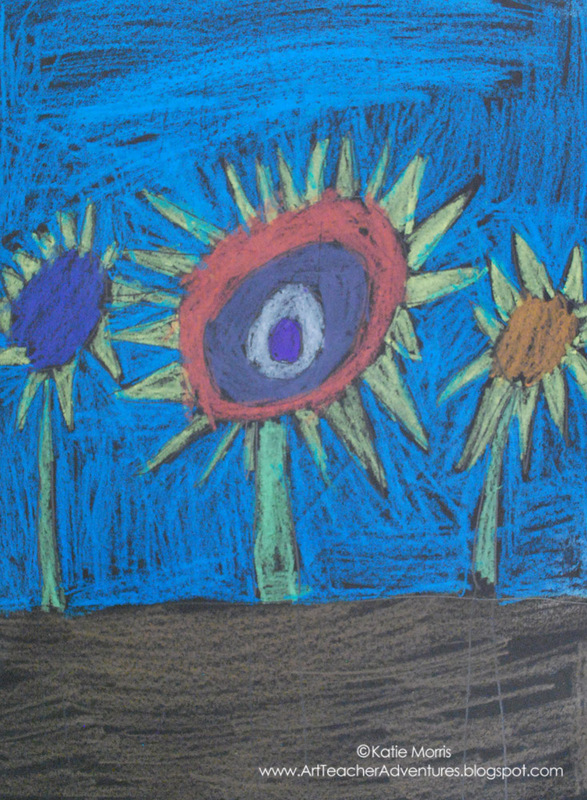 Some students finished drawing early and were excited to recognize one of the sunflower prints they had just learned about in a book. The next class period was spent adding color to the drawings with construction paper crayons. Admittedly, it was a struggle to get the students to cover all the black paper. Most got the point where I decided it was as solid as it was gonna get. Now that I ordered some better tempera paint, I might try having the Kinders paint on black construction paper instead of coloring. Yes, this is the same photo from above... I wanted a drawing to be the first photo that showed up but I also wanted you to see this drawing next to the other two. 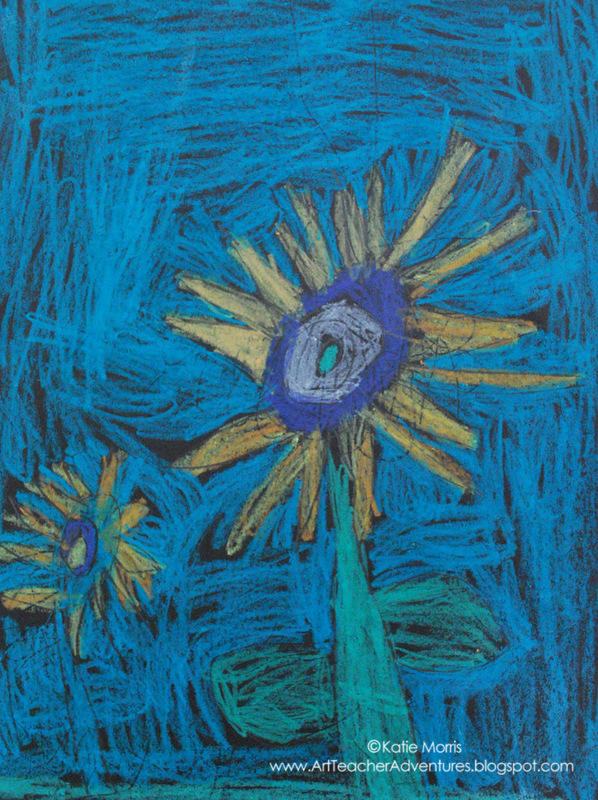 I was so impressed by this 6 year-old's drawing! I really like those blue backgrounds! These are simply beautiful. I've never tried construction paper crayons before- what are they like? They go on smoothly and you can get some results similar to oil pastels without the mess. They don't blend quite as well as oil pastels but I prefer them.